Sweet Sentiment: Who's ready for a Comeback???? Who's ready for a Comeback???? Oh yeah, Oh yeah, Happy dance time! It's Krafty Komeback day! Woohoo! .....and the lucky stamp is........ drumroll please..... WITCHY-POO!!!!! Mindy Eggen taught me how to make a could background with Distress Inks, so I used the ones in the photo and got with it! I stamped the sentiment directly not he background and tied a ribbon around it. 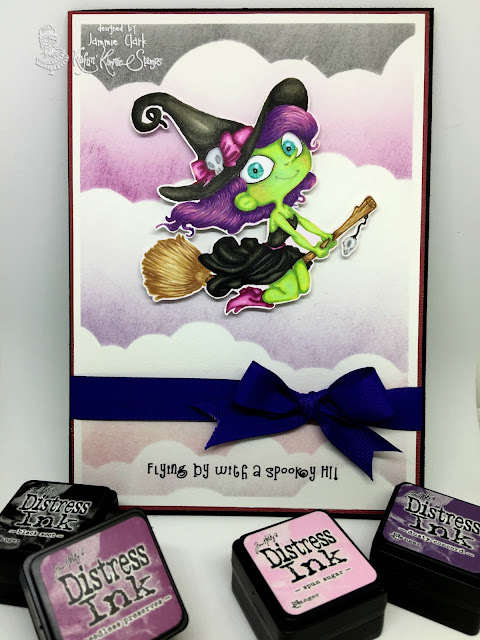 I used pop dots to add some detention to the card, and I colored little witchy poo here with acid green skin just like Wizard of Oz! He he he! Ok, scoop up little miss Witchy-poo while you can and get to crafting just in time for All Hallows Eve! Hooray! Have a wonderful Friday, see ya here tomorrow for a Saturday Challenge! Tootles!